Part Three in our series on training with power on a mountain bike comes from the perspective of our series author Tammy Sadle’s coach, Daniel Matheny of Carmichael Training Systems. Each year people flock to Leadville, CO and the infamous Leadville Trail 100 MTB race for the chance to experience the majestic feeling of riding down the red carpet on 6th Street. It’s awe-inspiring to say the least, and for anyone that has completed this race, crossing the finish line with goosebumps and tears of joy (and maybe some of pain) knows exactly what I’m talking about. Tammy Sadle, one of the new pros I coach (and author of Part 1 & 2 of this series), felt this last year as she rode the LT100 for Team First Descents as a fundraiser. Tammy secured a top 10 finish and the coveted “big buckle” for a sub-9 hour ride in her inaugural running of the event – as well as earned her status as a professional mountain biker. Believe me, it didn’t come easily, as it was Tammy’s first season on a mountain bike. We worked hard in training, and raced other ultra-MTB events like the Firecracker 50, Bailey Hundo, The Growler, and the Laramie Enduro as gauges of Tammy’s fitness. This year we took the same approach by scheduling other “tune-up events”, but we also had the help of a little objective measure called power, from a Quarq SRAM S2275 mountain bike power meter. This year, we didn’t have to guess on the fitness. In 2012, with new personal bests in some of these events, we were aiming for a top five finish at Leadville. Here’s what we did in the months leading up to the big day to prepare her for the feat ahead. July was the key month for us to build fitness while toeing the line at a few races to keep things fun. This was our time to buckle down and load up on training so that when the time came, Tammy could (relatively) relax, coast in, and let the taper happen. Luckily, in Colorado July is when much of the racing really heats up, and there are a plethora of events to choose from, including the Rocky Mountain Endurance Series, Winter Park Epic Singletrack series, one-day classics like the Firecracker 50, and the neighboring Wyoming’s 111-km Laramie Enduro. We built up Tammy’s weekly volume and intensity as the month progressed, which I tracked using the Dashboard within TrainingPeaks’ online training software. 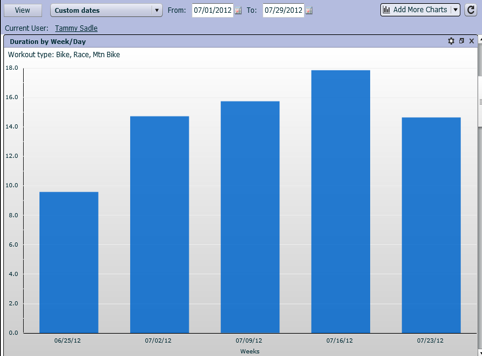 Below is the TrainingPeaks chart showing Tammy’s training volume each week in hours. 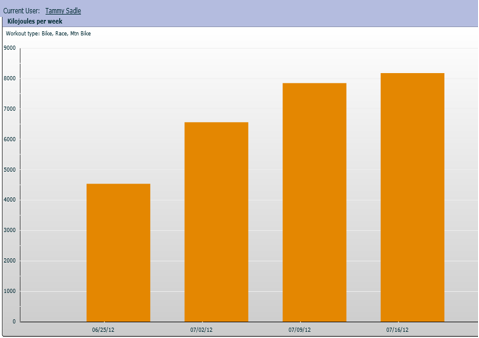 You can see the steady increase throughout the month that allowed Tammy to adapt as we built higher and higher. She went from less than 10 hours the last week of June, to nearly 18 hours the third week of July. However, volume can be meaningless unless you support it with quality work within that time. To measure this, we used the Quarq power meter on both her road & MTB to accurately track her kilojoules, a measure of energy or work done (basically 1 joule is equal to the energy used to accelerate a body with a mass of one kilogram using one newton of force over a distance of one meter…did you just get flashbacks to science class?) Tracking kilojoules with the use of a powermeter ensures that the actual work completed matches the increase in training volume. It is worth noting that without a power meter, it’s difficult to objectively track this actual work (kilojoule, expenditure) because most training devices use an algorithm to estimate calories burned. Below in the kJ/week chart in TrainingPeaks you can see Tammy’s kJ /week ramping through the month as well, from approximately 4500 kJ the last week of June, to nearly 8000 kJ the third week of July. Finally, we had to make sure that all this work and volume was resulting in fitness gains. 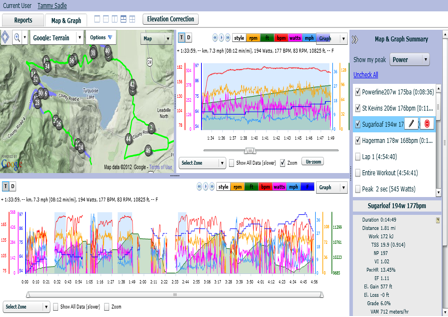 For this we used the Performance Management Chart (PMC) within TrainingPeaks. 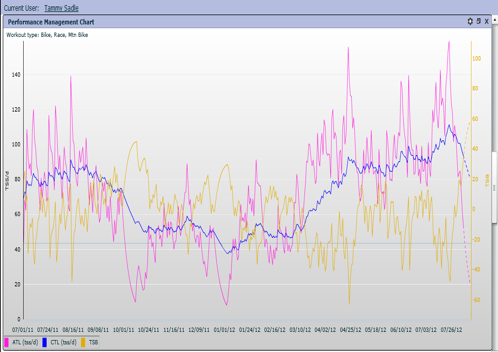 The training stress increases in July resulted in higher Chronic Training Load, or, as most know it: Fitness! In the image below, I took a shot of the past year in Tammy’s PMC to give you perspective of the build we were doing. Look at how Tammy’s fitness, as shown by her blue line, is significantly higher in July 2012 than it was this time last year. Tammy’s fitness is higher this year respective to last year because she accumulated more acute training sessions (ATL) or higher training stress (TSS) within those daily sessions. This means I couldn’t prescribe the same workouts as last year at this time because her body wouldn’t perceive those as stressors to cause further adaptions due to her current higher level of fitness. So her workouts included more work at a specific power range, or more absolute kilojoules to prepare for the demands of the competition. Many times with motivated athletes it’s hard to dial back the training enough to result in fresh racing, especially when they’ve seen early-season training builds chock-full of intervals result in big fitness gains. Well it’s often necessary, if you’ve done your work early, to have some time to “just ride your bike” when a big, important race is looming. This means some unstructured rides, getting out on routes that never fit the mold for good interval sessions, hitting up the local group rides, or reconnecting with some cycling buddies that one may have neglected along the way. Tammy welcomed this phase, and we actually gained more than valuable fitness – she gained some mental freshness too. One thing I’ve noticed as a coach is that when you’ve put in lots of focused training, it’s hard to not get a benefit from just riding the terrain, even without an interval focus. So without the parameters of intervals or the habit of hitting the lap button with the intent to hold a specific power, Tammy was able to log good quality rides bjust by having fun and pushing it at various points. Just in that week, she logged some great 2-3 hr training rides that fulfilled her “fun factor” and threw down a breakthrough XC race in Winter Park. Mission accomplished of good training for not only the body, but for the mind as well. Now it’s not all fun and games prepping for a beast of a hundred-miler like the Leadville Trail 100. Luckily I was head coach for the six days of the Carmichael Training Systems Leadville Recon preparation camps during July, and Tammy was able to join us for four days of fully supported training rides. The recon camp format was great for Tammy because the stop-and-go nature of the rides simulated interval training, with higher-paced segments and rest interspersed. We also had some very fit athletes come through the camps, along with other pro guests like Pua Mata and Gerry Cody that were both top 10 at LT100 last year. This upped the ante for Tammy’s competitive nature. Luckily with the Quarq power meter running full data each second on these recon days, we used the defining climbs of the course as figurative intervals. We agreed for her to ride these recon days with the goal to go hard on each climb, with the riders then regrouping naturally at the top. Doing these “intervals” on the course with an objective measure of power output was priceless in terms of training specificity, and in bringing her confidence on the mountain bike and the course to a peak. The Columbine Mine is almost one big interval but it’s broken up here as the initial six miles then the last steep mile. The last segment highlighted here is a section of pacelining heading inbound toward Pipeline aid station. You can see Tammy’s full workout here: http://tpks.ws/0r5p. Accepting that there would be a natural decline in power throughout the race due to altitude effects. 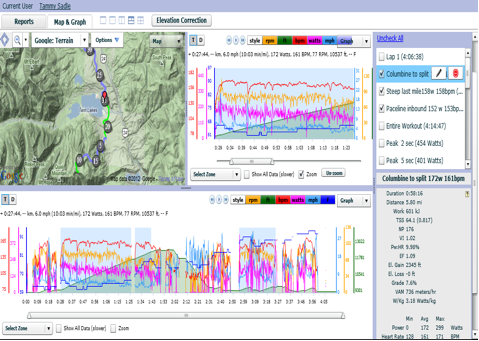 Also, thanks to the specificity we got from the recon training power data, we were able to construct and complete two Climbing Repeat workouts such as this one on July 26: http://tpks.ws/GemX. During these workouts, we targeted above-threshold pacing and repeatability. All during this build in July, Tammy secured some great results with a 4-hour effort good for 3rd at the Firecracker 50, 2nd place with a 2-hour XC-paced race at Winter Park, and the cherry on top: a PR of 5:47 good for 2nd place at the Laramie Enduro to round out the month! As the LT100 approached in August, I was confident in Tammy’s ability to best her 2011 Leadville race and threaten the podium for sure. The race was a success. Tammy closed the day with another Big Gold Buckle. Her time of 8:37 was good for 7th place in the Pro female division in her first full year as a pro. Just shy of the top 5 goal we’d discussed, but you never know what other talent is going to toe the line; all you can do is race your strengths once the shotgun blows at 6th and Harrison! Thanks to the hard work of the past few months, Tammy was able to handle the day’s demands of nearly 3900 kJ. During the race she burned the equivalent calories to 4.5 pints of Boulder Ice Cream and accumulated over 400 TSS (Training Stress Score), which by definition is the equivalent to riding 4 hours at threshold intensity! That’s a huge day in the saddle and with a few tweaks to nutrition and more targeted training using power data, I know Tammy has potential to go faster and finish even higher next year!